In the latest installment of Daily Boater's weekly Marine Product Review, Mark Sutton of MarineProductReviews.com test drives the Brizo, which may be the most unique and effective hull cleaning solution on the market. Brizo from Hullmate is a unique and innovative product that addresses a problem encountered by just about every boater... keeping your hull free from marine growth. Brizo is simple to use and is remarkably effective. And, there is nothing else like it out there. Brizo lets you clean the bottom of your boat mid-season without either diving on your hull or hauling your boat. 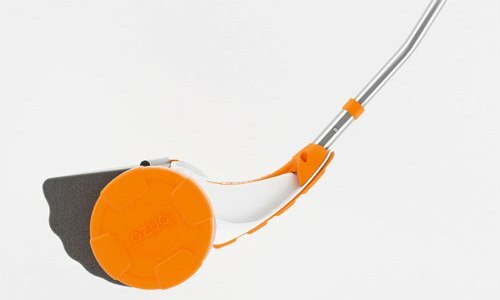 Brizo has a buoyant hull cleaning head that attaches to a sturdy but lightweight telescoping handle. The cleaning head uses a proprietary buoyancy system to maintain an even pressure against the hull to clean algae and slime off your hull quickly and easily. All you have to do is position it and swipe the hull, you don’t need to apply the pressure - Brizo does the work. You can use Brizo from either a dock or your tender, moving along your boat – dock is easiest. The length of Brizo can be adjusted to work on different boat sizes and areas of your boat. It takes roughly 15 minutes to clean each side of the hull on a 35’ boat. The Brizo is also designed to clean keels and rudders, but requires a slightly different technique from the hull. The benefits of maintaining a clean hull are that your boat will be more responsive, fuel efficient and faster! If used monthly throughout the season, Brizo will restrict slime growth, algae growth and even animal fouling including barnacles. Once you are done cleaning, you simply collapse Brizo and store in your cockpit locker or garage. The foam heads supplied with the Brizo last for the entire season (~ 6 months) depending on the frequency of use, and the cleanliness of your hull when you start using Brizo. The Brizo comes with different soft and hard grades of foam to accommodate different types of bottom paint. You will use the softer cleaning foam for softer ablative anti fouling paint and the harder foam for harder paints. If you value a clean hull and have ever spent the time or money to clean your hull each season, Brizo is definitely a product that you should check out. At only 195gbp (about $300 USD), Brizo will pay for its self in the first season and will help you get better performance, efficiency and enjoyment from your boat. Thanks Vin - The typo is now corrected in the post. And more importantly, thanks for reading! Thanks Vin as Andrew said for the catch and the read. What Is A Safe Boating Speed? Captain John: When in Doubt... Anchor Out!